I love pancakes but never make them because I think of them as a bit of a production (for the morning) and I don’t always have buttermilk or baking powder or soda in the house (I’m not a baker). Nor do I keep maple syrup on hand regularly. I like having some sort of whole grain in the morning and I haven’t seen many recipes for pancakes that consist solely of grains with no flour. Several months ago, the New York Times published a couple of interesting recipes for whole-grain pancakes and this was by far the simplest one. I LOVE cornmeal in any form, and for this recipe, the main ingredients were cornmeal, water, salt and milk. No eggs, butter, baking powder, buttermilk, etc. Pancakes this simple I could make every day, if I wanted. I started experimenting with this recipe in the ensuing weeks and have come up with my own version that I’m very happy with. First, I made the recipe exactly as called for in the newspaper. The recipe called for steeping the cornmeal in an equal amount of boiling water for about ten minutes, then adding milk. The recipe said to keep the consistency of the batter quite thick. That’s where I had problems–when I kept the batter thick, the cakes were absolutely leaden (nice cornmeal flavor but terribly heavy). I tried thinning the batter a bit, but still too heavy (I ate them anyway). One day I made the batter and only used half of it that morning. So as not to throw it away, I refrigerated it til the next morning, when it had become quite watery. I decided to try using it anyway. As soon as the batter hit the hit skillet, it spread out like a crepe and was instantly bubbling and full of holes. I cooked it on both sides and was certain I’d discard it, but I tasted it, and much to my surprise–it was much better than the too-thick version. Since then, I’ve tried to approximate some middle ground of thinness. The best way to describe it would be the consistency of light cream. The cakes should form open air bubbles on top almost instantly, but not spread out to the point where they all merge into one big pancake in the pan. I’ll try to give you exact amounts, but you’ll have to experiment on your own as I did. The recipe in the Times called for vanilla, but I preferred orange zest, after trying them both. The recipe also called for pine nuts, which I’ve included–but the cakes are perfectly wonderful without pine nuts as well. Lastly, the recipe in the Times recommended serving the pancakes with honey on top. I don’t always have honey in the house, but I usually have agave nectar, which is actually sweeter than honey, but very clean and neutral-tasting. It also pours better than honey and doesn’t add any extraneous flavor to the dish. It’s great! These pancakes take all of fifteen minutes to make and require you to have only cornmeal and milk in the pantry. Combine cornmeal and salt. Pour boiling water over cornmeal and blend with a fork to break up lumps. Let sit for about 10 minutes. Add enough milk to make the batter as thin as light cream. Add pine nuts (if using) and pour onto greased, heated griddle or nonstick skillet. When the batter hits the skillet, you want to see air bubbles form on top almost immediately. 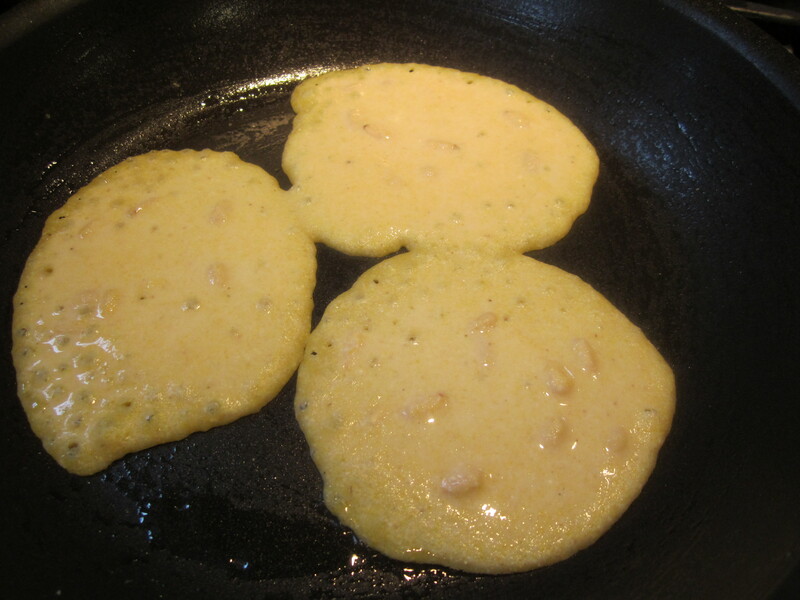 If no bubbles form, the batter is too thick–add some milk to the remaining batter and try again. 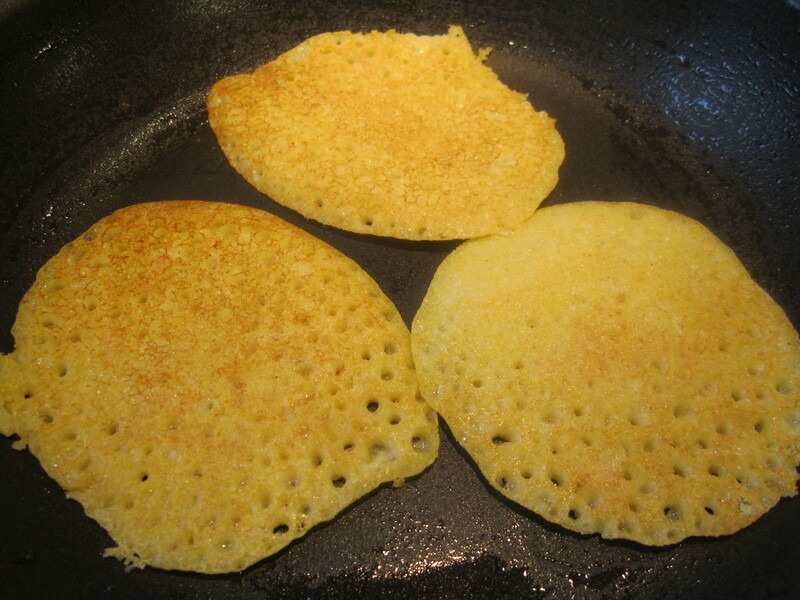 If the batter spreads to one big pancake, it’s slightly too thin, but better too thin than too thick. Cook for about 3 minutes per side, or until each side becomes golden brown. 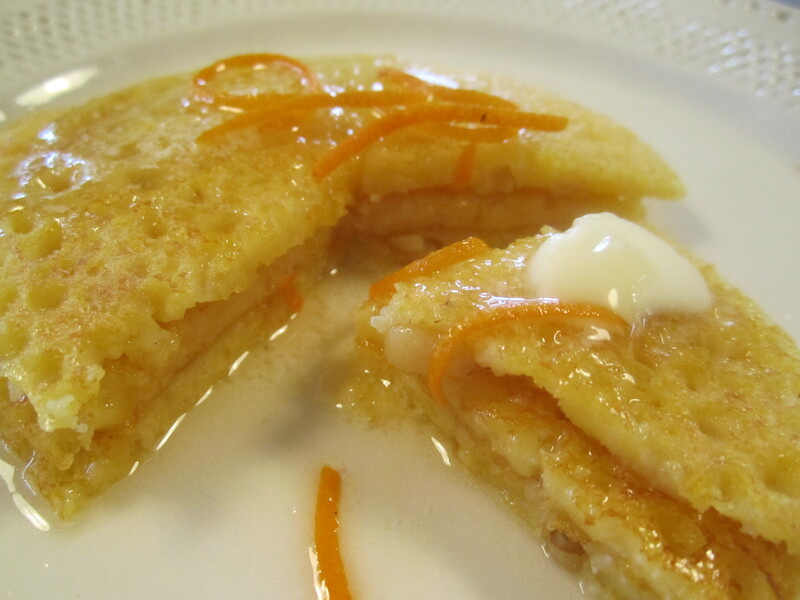 On the plate, immediately top the pancakes with a bit of orange zest, butter and agave. If you’re making more than one batch, place them on a greased tray and hold them in a 200 degree oven. Do not overlap them–if you need to make more than one layer, place damp paper towels between them. Believe me, if you’re a cornmeal lover, this ratio is worth experimenting with until you get it right!